This post is part 2 on Social Media Marketing Best Practices from IMS Minneapolis. The first post featured Brad Smith from Best Buy who offered insights into their social media principles, guidelines and learnings. 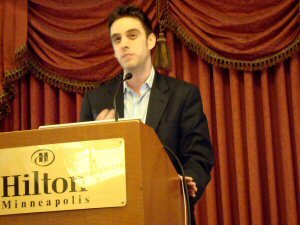 This post includes liveblog notes from the presentation given by Adam Singer of TopRank Online Marketing. Adam opened up noting that according to a research study by Russell Herder and Ethos Business Law, 14% of executives are unsure of social media, yet 70% expect to spend more. That set the stage for some of the common obstacles and barriers to social media adoption which he focused on in: 7 Common Social Media Problems and their Solutions. Many companies chase social media tactics with no idea about the who, what, when and where of the social web. It’s essential that companies first develop a listening program to answer those “W” questions. Listening through social media monitoring is critical to understanding brand, competitors and key terms relevant to your audience on the social web. Without a smart listening effort, companies miss key opportunities: marketing, customer service, sales, recruiting, partnering and public relations. 2. Unsure where it fits – who owns social media? As companies develop their social media programs, responsibilities and resources need to be allocated and that leads to accountability and “ownership”. For successful social media adoption within organizations, it’s important to establish social media goals and responsibilities in different parts of the organization. As resources and accountability are identified, the different departments can work to cross pollinate efforts, and work together as a team. Doing so helps leverage combined efforts and from an implementation standpoint, avoids conflicting representation of the brand. Companies need to be consistent with their social participation. Our clients at TopRank Marketing with the most successful blogs are those that post consistently. The solution to more consistent participation is to lead from the top, get executive buy-in. Establish goals and provide a feedback loop to contributors. As they grow, the community will provide feedback. Set aside resources, plan who will create content, monitor and engage. Tap passionate community members and activate them to be brand ambassadors. Create efficiencies through the repurposing of content. Believing that people will listen to and find value in what you really want to say requires confidence. Whether you’re right or wrong might not matter as much as being passionate. Now, more than ever, is the time to show leadership and conviction when it comes to social participation and engagement. “If you’re a B2B marketer and you’re not using social technologies in your marketing, it means you’re late.” Josh Bernoff, Forrester. The good news is that you can learn to be social media savvy through training, participation, listening and engagement. Data should help drive decisions, but don’t let it get in the way of creative ideas from your team. Adam relates the story of one of his clients, Joffrey’s Coffee where he recommended campaign changes based on his personal experience with the social web vs waiting for data to prove a concept. The result was a successful program by all accounts which is often cited as a social media marketing case study by others in the industry. Use real team members in your social media efforts. Don’t use some faceless person behind “Brand X”. Forge relationships with others. Put others in the spotlight. “Give to get” and be focused on serving and being useful. Don’t send in legal right away as an initial reaction to social dissension. Read the “Streisand Effect” for more on what happens when that backfires. Embrace personal brands, don’t worry about them getting too popular because their allegiance is to the brand. In the end, companies can win on the social web by developing a strategy, experiment and iterate. And if you get lost, you can always get help.